Fritters are no joke. You can just about turn anything into a fritter and almost all of the time it will taste pretty good. Parsnips are no exception. 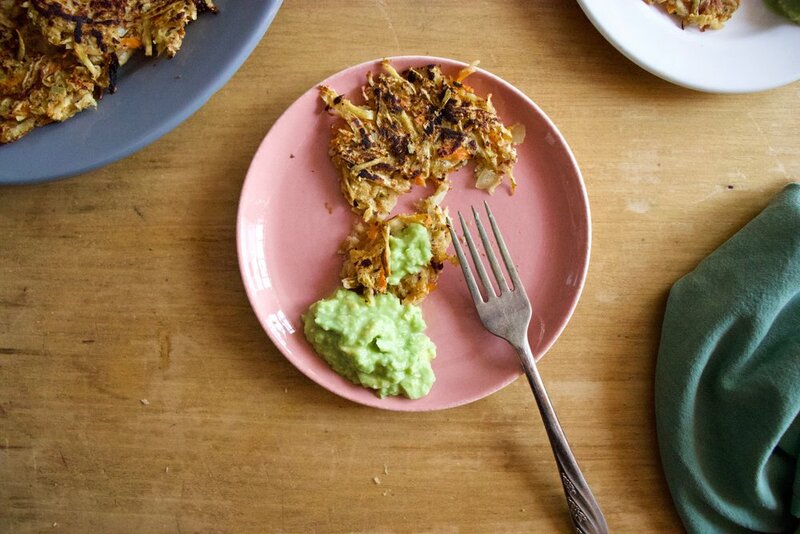 Tasting the way parsnips do, straight up without any extra spices, these fritters will hit the spot if you are on the lookout for a fritter for your fritter seeking self. And what if you are not sure you like parsnips or fritters for that matter. Stop right here. You probably do and just don’t know it yet. I guess the only way you will really know is to make a batch. Then you can tell me all about how you love parsnips and will now be making fritters for every meal every day for the next week. The stuff. Parsnips (I only needed one because mine are humongous) a carrot, an onion,. some garlic powder. a little oat flour, a flax egg, and some olive oil. Also if you want to serve with avocado mash (which tastes great together), well grab one and a lemon too. Start being shredding the parsnip, carrot, and half the onion into a big bow. Chop up the other half of onion into small bits. 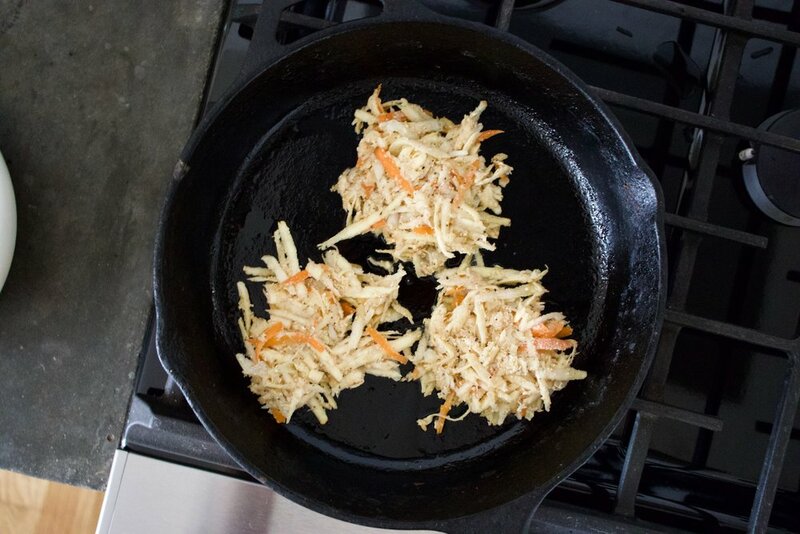 I do this because grating onion only turns the onion into a juice and I like the little bits if onion in my fritter. Shredded and mixed. And pretty too. Add in the garlic powder, a little salt and pepper, the flax egg, and the oat flour. Mixed and ready for the cooking. A medium hot frying pan with a little olive oil is what you need. Make medium sized flattish patties and cook until nice and golden brown. Flip and cook the other side just the same. Fritters are done and could be eaten now too, but I like to stick them on a baking sheet and into the oven for 10 minutes or so to really crisp them up. If you want to serve with avocado, just mash half of one up with a pinch of salt and juice of lemon. And that is that. Out of the oven, onto a plate, and into the mouth. Shred the parsnips, carrot and half the onion into a large bowl. Mince the second half of onion and mix into the shredded. Add a pinch of salt and pepper, the flax egg, and the oat flour and mix until evenly incorporated. Grab a flying pan, add a little olive oil, and place on medium high heat. Once pan is hot, scoop about 1/4 cup of the mixture into pan, trying o keep it compacted. Let it cook for a few minutes then with a spatulaf gently tamp it down. Flip and let the other side cook until golden brown. Once they are cooked, they can be eaten, but I like to place them into the oven for about 10 minutes to cook and crisp up a little more. Once done, serve anyway you like, but mashed up avocado with lemon is fantastic. Tahini would also rock. Me. Food Maker-food eater Woo HOO! GET NEW POSTS IN YO EMAIL!